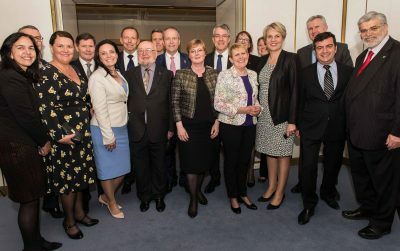 The Parliamentary Friends of Australian Books and Writers (PFABW) was launched at Parliament House in Canberra on 12 September. The group is co-chaired by Liberal senator Linda Reynolds and Labor MP Graham Perrett, and aims to provide a forum for government members to ‘meet and interact with the publishing industry on matters relating to the work of writers, printers, publishers and the whole of the industry’. The launch was attended by authors, booksellers, librarians, copyright agencies, literary agents and book printers. Attendance by MPs at PFABW events is by invitation. A spokesperson for the Australian Publishers Association told Books+Publishing that core members include Bill Shorten, Tony Abbott, Mark Dreyfus, Tony Burke, Tanya Plibersek, Anthony Albanese, members of the Nick Xenophon Team (NXT), and Sam Dastyari. Reynolds said the parliamentary friendship group will ‘allow us to better support and engage with the whole Australian book industry’. ‘It will also help us highlight the significant contributions this industry makes to many facets of Australian life,’ said Reynolds.